So I thought I was doing 8 gigs on this tour… then I had an attack of madness and decided to go to Rotterdam one day before the gig. Smart move. I went to Copenhagen last week and had a fabulous time, my senses dazzled by this stage show and hearing Reality live plus the wonderful company of so many Bnetters. Yesterday was better. Everything: it was more polished, the set list was more varied and the running order and flow of the show is down pat (after only 5 gigs no less). We got there late so ended up about 10 rows back on the left. It’s funny to me now how that seems miles away. Before Poughkeepsie I’d seen each Bowie gig from the back of a stadium and now, I admit, I’m totally spoiled. I guess the one thing I was after, unattainable you might say when you went to Poughkeepsie and Riverside, was surprises. Even having seen the show last week I still wanted them. Second song in? Jean Genie. And then Fashion. And then Try Some, Buy Some. First performances on the tour. Well, that’s sorted. I was delighted that so many of the audience knew the Heathen songs, maybe I shouldn’t have been surprised. It is his highest profile and impact album in years. Slip Away has really become the great anthem from it for this tour. Set list... well, we all have our opinions on it. Personally I’m over it: I could, as could you, choose a 50 song set list not played last night or any other on the tour. But what has been chosen fits completely with the band and the demands of an arena tour. Having said that there were tunes that just about took the high roof off the Ahoy in Rotterdam: Suffragette City (brilliant as ever), Changes, China Girl, Ashes to Ashes, Let’s Dance etc. I was thrilled to hear The Motel (never heard it live before) and an exquisite Tibet gig style version of Loving the Alien. Having never travelled to see him live outside England I wondered if there was a point where I’d get fed up of hearing the same songs. After 4 gigs so far this year I can only say bring it on! I’m getting more excited with each passing show and feel a bit like a runner on starting blocks waiting for the gun to go off… next stop Frankfurt. I found this old review, never printed, and thought I'd share it with you because I'm feeling generally blog uninspired at the moment and this harks back to a thrilling time. 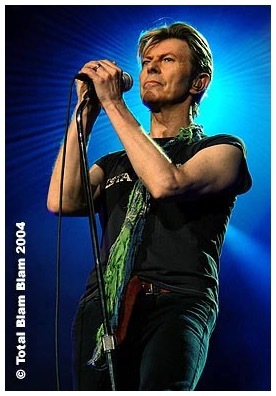 I wrote this review of a Bowie show in Frankfurt in a hotel. I'd been to a drunken after party when the gig was over and I didn't start writing til about 1am and though I wrote it fast, as I always do, it was just too late to get into Bowienet news. In fact, it's the only review I've written that *didn't* get used as the official review, I've been pretty lucky in regard to getting my reviews printed there. I miss those times and hope that they return soon. I remember this piece being very hard to write, literally, because all the keys on German keyboards are in different places to regular computer keyboards! So here I am in Frankfurt trying to get my thoughts together about this gig. Firstly I must say the Dandys were good tonight: all foppish caps and louche demeanour. The best I've seen them so far. He started with Jean Genie for the second time in a week (the first I saw too in Rotterdam) which was a bit of a surprise, having only started with NKS thus far up until Wednesday. Storming versions of Battle for Britain tonight and a quite amazing run through of Suffragette City. The crowd took a bit of warming up but by the end were his. Spaceboy raised the roof as ever and Ziggy sent us home happy to say the least. What struck me most of all tonight, watching the crowd, was how he has them in the palm of his hand. What a performer, filled with experience and knowledge of how to, pardon the phrase, get everyone off. Each Reality song improves with every play especially Never Get Old: he'll be playing it for years. Hearing Heroes performed in Germany was something I thought I'd never hear so it was such a pleasure and very different in terms of vibe from hearing it in England, for example. I tell you, I'm knackered and I've only done 3 gigs. I have no idea how he does this night after night... the man has stamina to shame us all! Next gig won't be for a month (in Lyon)... can't wait!! For me this was the end. No Glasgow trip possible so last night at Wembley was the culmination of my Reality tour. After 9 gigs (not including Poughkeepsie and Riverside), 12 flights, one hospital visit and more trains, buses and taxis than I care to look at my empty bank account over, for me it ended last night in London. As he raised his arms and sang the last words at the end of Ziggy I shed a happy tear for all the friends I’ve made and songs I’ve heard. It wasn’t the first tear shed. Five Years in Lyon saw to that. Then there was almost getting thrown out of the gig during NKS in Copenhagen, getting lost in Rotterdam, getting elbowed in Frankfurt, 9 hours of driving for Hanover, a morning in casualty in Manchester, at the front again in Dublin… the list goes on and on. So much has happened since October 7th. I stepped into Wembley Arena last night with a huge amount of personal sadness that it was all about to end. The show has become so familiar, but no less thrilling, to me. The music starts and David's voice booms out something along the lines of: ‘That’s good, let’s try that again’. The lights go out and the animation starts. Rebel Rebel (usually!) opens the show perfectly. I had hoped tonight would be different to Tuesday’s show since the second nights played in the same venue usually are: I wasn’t disappointed. Fashion instead of Fame, Big Car, an early inclusion of Hang on to Yourself, Be My Wife, Jean Genie, White Light White Heat and Starman for the first time on this tour! It’s always a pleasure to hear Fantastic Voyage too. I’ve never been so floored by a vocal as I am by Gail’s in Under Pressure; the notes she hits are quite astounding. Every member of the band fits perfectly and certainly Gerry has added a dimension to the music I’ve never heard before. It seemed to me that seeing both nights at Wembley presented a complete picture of the show. The audience, shackled by seating and over zealous security, were appreciative though I was surrounded by the kind of fan who is rather happy to hear the hits and has a bit of a sit down during the songs they don’t know. Seeing Bowie in such a mainstream venue it did make me think about his appeal and the reaction to Life on Mars was the best example of it. There’s something about LOM at the moment that is really getting to me: I can barely get through it without choking up, something that has never happened to me before. Seeing the massive sing-a-long and standing ovation I realised that he, to us, is this familiar character who tells daft jokes that only we get and plays Bnet shows in venues you’d never get a ticket for otherwise. To the other 95% of the audience last night he was an untouchable icon, they were listening to one of the greatest songs ever written and couldn’t quite believe he was standing right there belting it out. When you're in a massive arena and he's being appreciated by 10,000 it makes you realise who he really is. Watching him hold every single person in Wembley enraptured was wonderful and it made me even more grateful that I’ve been able to share so many moments like that over the last 7 weeks. My thanks go to: David and the band; to my BNet family who made me so welcome in so many European destinations; Trevor and the Gnome for the best after party in history and to Blammo for putting up with my incessant waffling – over email and the phone from New York, gibbering as I was at 5am after Poughkeepsie. Now we’re sending him across the ocean to carry on this amazing spectacle outside Europe. Treat him well, look after his voice and enjoy the rest of the tour. So he’s been in America for 7 months. I watched in envy as the tour rolled across the country, flattening all in its path. New setlist additions, new scarves, same old shoes. I couldn’t wait to get to the first gig back on European soil. It turns out I’m severely out of gig practice because, 2 days later, I’m still aching from the sheer exuberance of the performance at the Amsterdam Arena. He’s as fresh as a daisy, but I’m getting too old for this. Arriving late I somehow got a great place about 5 rows from the front, no mean feat in a stadium filled with 25,000 fans. The setting was unusual, the stadium roof was on but it was still daylight. As soon as the cartoon kicked in a wave of happiness and contentment descended over me, like I was being transported back to all the gigs I did last year. 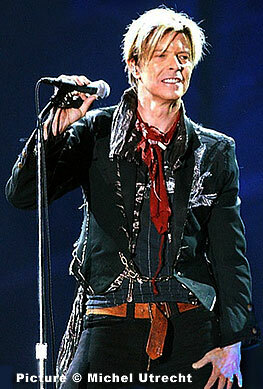 I never tire of Rebel Rebel, it really is the perfect gig opener. But then… Panic in Detroit! I’d never heard that live before, such a treat. He complained at us for singing All The Young Dudes, and said as our punishment we had to endure a song from the 80s! He took the piss out of the terrible arena acoustics "You’ll be hearing these songs twice tonight, maybe more!" He was in great form, tons of jokes and filled with enjoyment at being back in Europe. After over 100 gigs I don’t know where he finds the energy. There was a cheeky dig at the Yanks he’d just left behind. "It’s so lovely to see a crowd filled with such pretty people. Everyone’s so pretty. And I should know, I just got back from America! I feel like a man finally finding water in the desert!" It was such a wonderfully familiar feeling: seeing him enjoying the crowd, Susan bouncing at the front, Cat’s infectious grin, Gail’s soaring voice, Slick’s playing even more killer than it was last year… I can’t think of anywhere I’d rather be and am now gutted my next gig isn’t until Monaco. Watching the American reports with excitement at the new setlist additions I tried to avoid thinking about any new songs I might be getting, even refusing to say the names of the songs I wanted to hear the most. 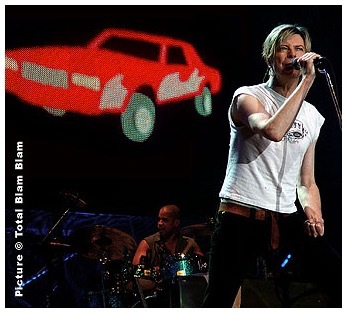 I can say it now because he played it: Station to Station. I have never wanted to hear a song more and my god the band nailed it. 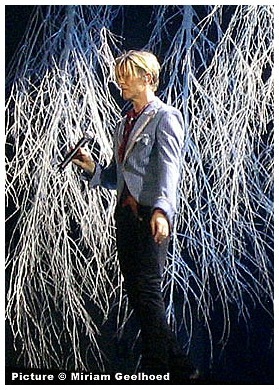 I had heard it once before; my first ever Bowie gig at Maine Road in 1990. I don’t remember that performance of it but I’ll never forget this one. This might sound flighty and over-exaggerated but I think I may have had some kind of religious experience during that song! I looked up (way up, the stage was much higher than usual) at him, the returning Thin White Duke throwing darts in lovers’ eyes and I wanted that complete and perfect moment never to end. Diamond Dogs wasn’t half bad either. Quicksand completed the trilogy of songs I’d never heard before. All in all, a perfect return to Europe for him and a memorable night for me. Next stop Monte Carlo!